I've decided to start posting a Daily Tip for GP users because I've noticed that a lot of the blogs are technically oriented toward we consulting folks and advanced users. Even the forums seem to be more technically oriented than when I first started reading them. So, I want to appeal to those users who occasionally just need a little help with the basics. I posted the first Tip today on 'Changing Currency Decimals on Inventory Items'. I'd like your help coming up with a name for this daily tip. I'd love to call it the Daily Dynamic but our friend Mr. Polino has his 'Weekly Dynamic' so I don't want to plagiarize him. Any ideas? The winner will receive a free one-year subscription to my blog - LOL. 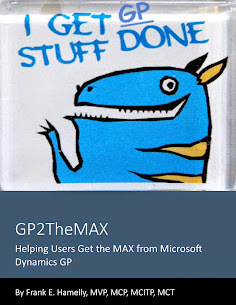 Oh, and let your colleagues and clients know to tune in to gp2themax to pick up their daily tip. What about "Dynamics Du Jour"? (Can't you just picture it...'did you see the DDJ today'?). Sure, it's a little on the 'Frenchie' side, but chez chic! Love your site mon amie!